The Liberal Studies journal (LSJ) is trans-disciplinary in nature to create a unity of intellectual frameworks beyond the disciplinary perspectives. Each issue of the journal amalgamates research articles, expert opinions, and book reviews on various strands with an endeavour to enquire the contemporary world concerns. The Journal aims to serve as an intellectual forum for humanities, arts, and social science scholars to put forward and converse on local and global issues, both from academic and policy perspective. The main objective is to provide a platform to researchers from academia and industry to share and disseminate ideas in critical issue areas. The Journal aspires to be a leading international journal in bridging the long-standing gap in the existing social science literature dissected on disciplinary lines. Does Higher Defence Organisation in India Require Major Surgery? Does the China-Pakistan Economic Corridor Really Help Pakistan? Sedition: Crucifixion of Free Speech and Expression? Is the World Prepared for A Refugee Governance Crisis? Hacking – Tracing the History: What can India Do with its Hackers? How Come Boys Get to Keep Their Noses? SHOULD INDIA RETAIN DEATH PENALTY? The biannual Liberal Studies journal (LSJ) is trans-disciplinary in nature to create a unity of intellectual frameworks beyond the disciplinary perspectives. Each issue of the journal amalgamates research articles, expert opinions, and book reviews on various strands with an endeavour to enquire the contemporary world concerns. The Journal aims to serve as an intellectual forum for humanities, arts, and social science scholars to put forward and converse on local and global issues, both from academic and policy perspective. The main objective is to provide a platform to researchers from academia and industry to share and disseminate ideas in critical issue areas. The Journal aspires to be a leading international journal in bridging the long-standing gap in the existing social science literature dissected on disciplinary lines. 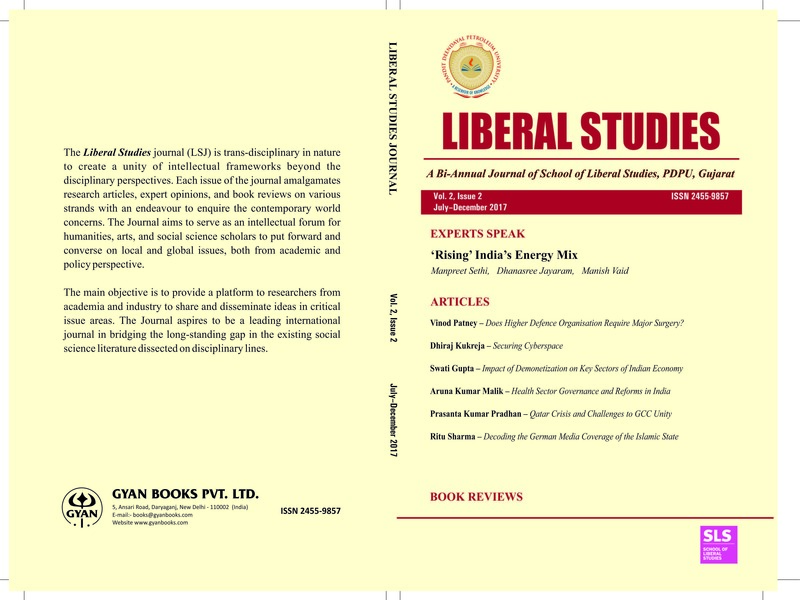 Beside, each issue of the journal carries Expert Speak – Op-Ed type articles of 3000 (+/-) word limit – on one of the contemporary aspects of national or international discourse from eminent scholars and policy makers. The aim is to provide an intellectually stimulating forum to examine various aspects of contemporary issues, and advance policy-oriented perspective. The journal also carries a Book Review section for analytical review of latest books on relevant issue areas. Interested reviewer has to seek permission of the Editorial Board in advance to review the specific book. Each review will be of 1500 (+/-) words. Articles should be original, not published anywhere else before. To republish the article accepted in JLS, the author needs to seek written permission from the journal. Use British rather than American spellings all along. Quotations of three or more lines should be indented with single space, with a line space above and below. Use ‘twentieth century’ instead of 20th Century, ‘1990s’ instead of nineties. Spell out numbers from one to nine, 10 and above to remain in figures. Use ‘per cent’ instead of %. Use thousands and millions instead of lakhs and crores. Diagrams, tables, maps should be provided with proper citation and acknowledgement. Each article should carry an abstract of around 200 words. All correspondence should be addressed to: The Managing Editors, PDPU Journal of Liberal Studies, School of Liberal Studies, Pandit Deendayal Petroleum University, Raysan, Gandhinagar. Affiliation of the author with complete postal address, contact numbers, and e-mail must be provided along with the articles in MS Word format. The Editors of LSJ reserve the right to suitably amend and edit the text. The views expressed by the authors are their own and do not reflect the views of PDPU. Opinion-based short article without citation. If citation is necessary, use it within bracket inside the text. JLS follows endnote pattern of citation, not ‘Reference’ list. Single Authored Book: Surname of the author, First name of the author, year of publication, Title of the book in italics, Place of publication: Name of the Publisher, page number. Two authors: Surname of the first author, First name of the first author and Full name of the second author, year of publication, Title of the book in italics, Place of publication: Name of the Publisher, page number. More than two authors: Surname of the first author, first name of the first author, et al., Title of the book in italics, Place of publication: Name of the Publisher, page number. Articles in Journals: Surname, full name of the author, year, name of the journal in italics, volume, number (period of publication), page number. Internet sources: Along with the above style, give full URL, date of publication, and date of access by the author. Mention in the beginning in bold the full name of the Author/Editor, name of the book in italics, place of publication, name of the publisher, year of publication, total pages, price of the book. Contribution to existing pool of literature: The reviewers are to review the manuscript’s novelty in terms of its contribution to the existing body of knowledge on the subject. Articulation: Articulation of the research question, comprehension, and argument on the theme and conclusion. Methodology: In case of a manuscript on issue relating to science/economics/market, etc. clarity of data collection, research design, sampling, etc. has to be strictly observed and verified. Policy Implications: The reviewer should review the aptness of the implications of the policy suggested by the author. Language: Strict review of lucidity of language, flow of arguments/analysis, consistency, etc to be given equal importance. LSJ is a referred journal. Articles/papers have to undergo anonymous peer review to maintain high quality of the content. A list of resource persons with specialisation on various issue areas for review of articles is maintained. The final choice to send or not to send articles/papers for peer review rests with the Editors. First, all submitted manuscripts are read by the editorial staff. Second, manuscript aligned to the scope and objective of the journal are send for review process which take approximately a month. Third, as per reviewers assessment the editorial office will communicate the final decision to the contributor about the status his/her paper whether ‘Accepted’, ‘Minor Revision needed’, or ‘Major Revision needed’. Fourth, the authors have to return the revised manuscript and return in a stipulated time line as communicated by the Editor’s office. Thorough plagiarism check is undertaken using the Urkund software. Reproducing text from other papers without properly crediting the source (plagiarism) or producing many papers with almost the same content by the same authors (self-plagiarism) is not acceptable. Authors may not present results obtained by others as if they were their own. Authors should acknowledge the work of others used in their research and cite publications that have influenced the direction and course of their study. Duplicate submission: Simultaneous submissions of the same manuscript to different journals will not be accepted. The submitted article will be removed without consideration. All issues of the journal can be accessed freely. Users can download the full texts of articles/opinions/book reviews. LSJ does not charge any fee from the authors. Rather, author(s) of each published article/opinion/review is offered a modest honorarium in recognition of their time and effort. The soft copies of articles/opinions/reviews are available for free download. However, those who are interested to subscribe the hard copy of journal are requested to communicate the printer - Gyan Books Pvt. Ltd., 5, Ansari Road, Daryaganj, New Delhi – 110002, India. You can download the subscription form and send the request.